Wineries, art galleries, horse riding, glass blowing, sailing, fishing, quilting, cheese making: all testify to the many facets of this truly amazing area. Numerous bush walks meander through lush rain forests, across pristine water courses, and past beautiful waterfalls. Tourist drives skirt outlooks that provide spectacular views to the beaches of the coastline and vistas over rolling green hills to the ranges beyond. With Steve Irwin's Australia Zoo, postcard perfect beaches and all the other attractions of the Sunshine Coast just a short drive away, this area has something for everyone. 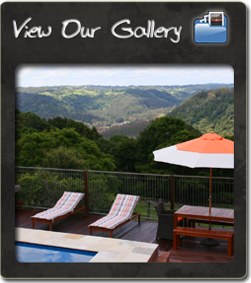 Holidaying in the area or just passing through, Montville Holiday Apartments provides the perfect location. Home ~ Apartments ~ Facilities ~ Rates ~ Attractions ~ Map ~ Contact Copyright © 2016 Montville Holiday Apartments All rights reserved.